2XU created the Active range for the amateur athlete who has a taste for high-performance gear. They have integrated technologies from their higher-end suits to provide you with a piece of kit that will help you to perform to the best of your ability at a lower comparable cost. The 70 denier fabric material provides muscle stabilisation by compressing your muscles. This helps to break down the build-up of lactic acid and also promotes a faster recovery. 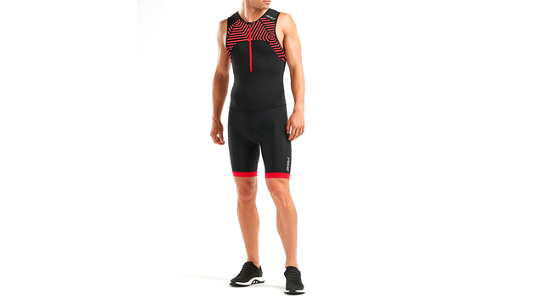 The mesh panels found on both the top and bottom of the suit promote moisture management through airflow engineering, keeping you cool and feeling comfortable in the most intense parts of your racing or training. Finally, the Speedline chamois offers the support you need in the saddle whilst also remaining discreet on the run. All in all, this is a great value suit ready to be used in all triathlon race distances. Utilizing a nylon-LYCRA® fibre matrix with high- lament hydrophilic nylon yarn and optimal airflow engineering, Sensor Mesh represents the ultimate in moisture management. With the inclusion of LYCRA® fibre from Invista, unparalleled comfort is assured.